Exterior adhesive window vinyl is stuck to the outside of the window. It looks best because the material is on top of the glass – and you don’t get the reflection from the glass’ surface. We have many different grades of exterior window vinyl. There are temporary & permanent adhesives, as well as matte, and glossy laminates and inks. This allows us to use just the right vinyl for your advertising project whether it’s short term or long term and at the best possible cost. Our aggressive print and installation prices have brought us some of the most reputable clients. Just check out our gallery. Finishing Options: Cut Shape – Large format prints can be cut into any shape or size. No Laminate – Print without laminate to save on cost for shorter term projects. Glossy Laminate – Adds a reflective shine to your print adding depth and gloss. Matte Laminate – Matte is the “modern” look. A flat finish with deep colors. Edge Trim – Finishing installation around cabinets, and other fixtures to walls. Black Back – To block light from coming through the print – designed for windows. White Back – Will allow some light to come through the print – designed for windows. “Light box material, AKA – “light box film” is specifically designed for use inside of a light box. The ink colors, and material are been adjusted for light to shine through from behind the graphic. Backlit films must have a light behind them for the colors to come through correctly. 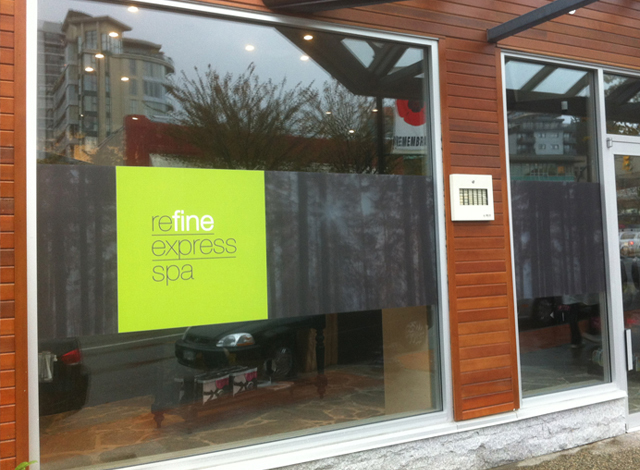 Large format window vinyl must be installed by a certified, licensed, insured and bonded professional. Glass should be cleaned, and any old advertisements should be removed. We will re-prep the glass before applying the window film. We guarantee our work is bubble and wrinkle free!